Described as a miniature continent, Gran Canaria is more like three continents on one island. Blessed with a diverse topography, the third largest island in the Canaries is also surrounded by 236 kilometers of coastline. From the ever-changing dunes to the lush pine forests and dramatic volcanic landscape, the island is also home to half of the population of the Canary Islands and a haven for adventure-seekers. 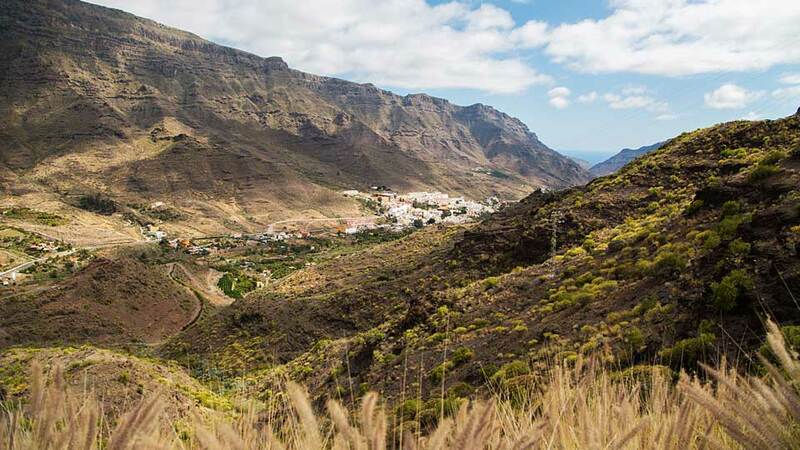 Including 6 rural towns, almost half of Gran Canaria has been a part of UNESCO’s list of World Biosphere Reserves since 2005. Its diverse flora and fauna, vivid geological attractions of volcanic origin, and rich archaeological heritage attract over 2 million visitors each year. The island’s guarded areas are classified into Natural Park, Rural Park, Natural Monument, Protected Natural Reserve, Special Natural Reserve, Protected Landscape and Site of Community Importance (SCI). 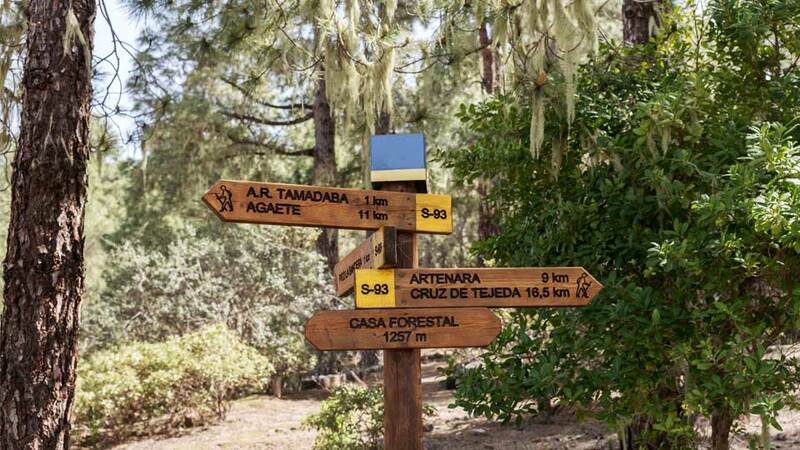 The rare geography of Gran Canaria allows guests to connect with nature. Furthermore, the island serves as a habitat for protected species. It also cradles many of the world’s best archaeological and geological treasures with 4 National Parks and 10 National Monuments. One of the biggest Natural Parks in the island is Tamadaba Natural Park. It covers the northwestern town of Agaete and runs southward to the towns of Artenara and La Aldea de San Nicolas. The picturesque web of mountains, valleys, and slopes are homes to endemic species of pines, cacti, and birds. Going inland, visitors could take on a soul-searching hike up to the famous Natural Monument of Roque Nublo. Standing at 80 meters tall at the center of the island, this is the world’s largest free-standing rock. From this vantage point, guests could see a breathtaking view of Gran Canaria and the Teide Volcano on the neighboring island of Tenerife. The iconic rock in the clouds and the Tejeda Basin below are parts of the larger Parque Rural del Nublo, one of the two protected Rural Parks on the island. More panoramic views await further down at the Pilancones Natural Park in San Bartolome de Tirajana. The pine covered peaks are part of Europe’s Special Protection Areas for wild birds. Here, guests could take a deep breath and enjoy the crisp cool breeze while listening to the birds’ melodic chirps. In large part, due to the efforts of UNESCO and the local government, Gran Canaria remains unspoiled with 8 Natural Reserves, 7 Protected Landscapes, and 4 Locations of Special Interests. On the South, guests stepping into the Maspalomas Sand Dunes feast on the enormous expanse of sands and hills that change daily. Located near the Northern coast of Africa, the dunes are also referred to as the mini-Sahara Desert of the archipelago. From the coastline, this Special Nature Reserve stretches some 3 kilometers inland. Although smaller than the Sahara, the tranquility and vastness of the open space still make one feel like a tiny speck while marveling at the beauty of the landscape. Southwest of Roque Nublo, the mountains of Inagua, Pajonales, and Ojeda is the site of the Integral Natural Reserve of Inagua. An unforgettable adventure awaits bikers and hikers through designated trails. Among the diverse flora and fauna, guests might also catch a glimpse of endangered endemic species of the island. Set among a web of mountains, the reserve also offers a marvelous view of the cliffs and hills. The historical village of Fataga sits in a valley amidst cliffs and palm trees. Known as the valley of a thousand palms, the site is also one of the Protected Landscapes of Gran Canaria. The pride and joy of the town of San Bartolome de Tirajana one of the most beautiful villages on the island. Walking around the idyllic village, it is hard to imagine that Fataga was once a battleground. It was here where some of the most notable battles between the Guanches and Spaniards took place during the 16th century. Today, Fataga is a candidate for UNESCO World Heritage site. 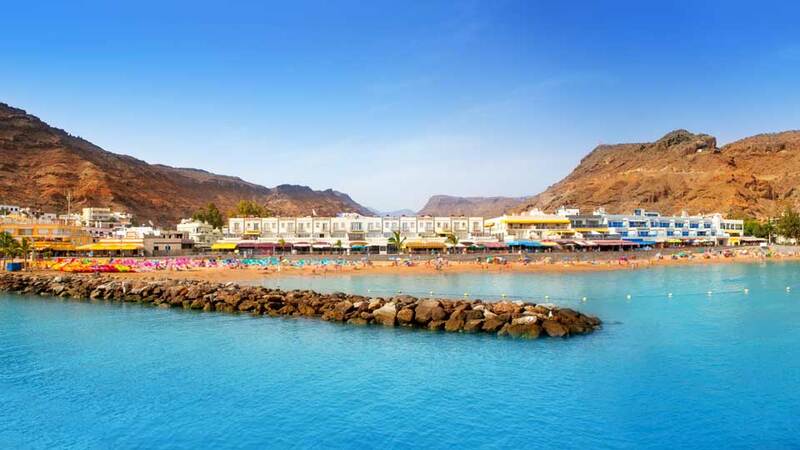 Gran Canaria, like its neighboring islands in the Canaries, is a paradise for beach lovers. With 60 kilometers of beaches all around the island, there are choices for all kinds of travelers. Some beaches have calm waters that is perfect for children, others would offer surfers quite a challenge. While some beaches are full of visitors, there are others that no one seems to know about. For naturists, there are also designated nudist beaches. 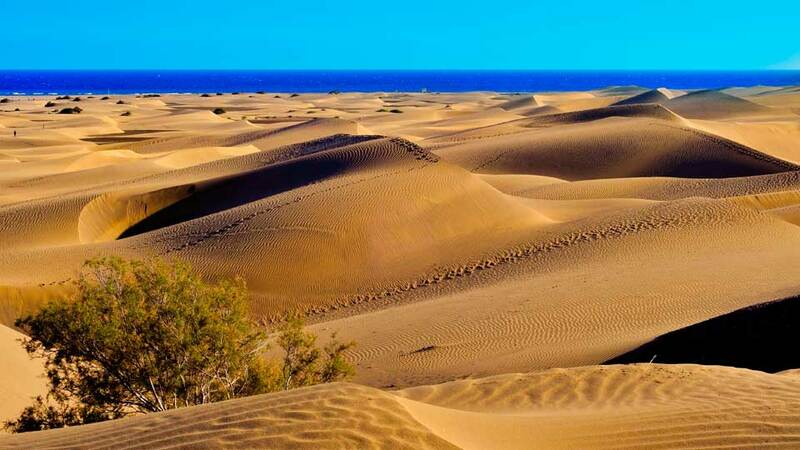 The sand dunes of Gran Canaria extends out to Playa de Maspalomas and the calm sea. Further along is the less crowded Playa del Ingles. During sunsets, the iconic Maspalomas Lighthouse is the perfect backdrop amidst the golden sky. While some people might go back to their resorts, this is also when the beach comes to life with its renowned nightlife. 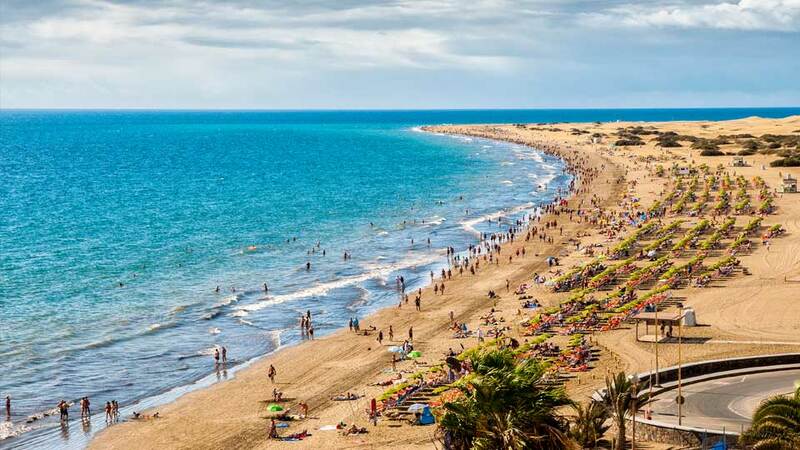 Besides the designated areas for nudists, both Playa de Maspalomas and Playa del Ingles are also a haven for the LGBT community with exclusive bars and resorts nearby. Crowning the island in the northeast is the urban beach of Playa de Las Canteras. No one can miss the longest beach on Gran Canaria which is right around the corner from the capital city of Las Palmas. Its long stretch of well-kept golden sand and ever tranquil turquoise waters paired with a long shop-lined promenade make it ideal for swimming, sunbathing, strolling, and shopping. Ranked by TripAdvisor as the top outdoor activity in Gran Canaria, Las Canteras is an adventure seeker’s paradise. Snorkelers can catch a glimpse of the magical aquatic world in a nearby reef. Below, scuba divers get a closer look of the reef teeming with marine life. The gentle waves on the southern tip of the beach is also a great place to learn surfing. 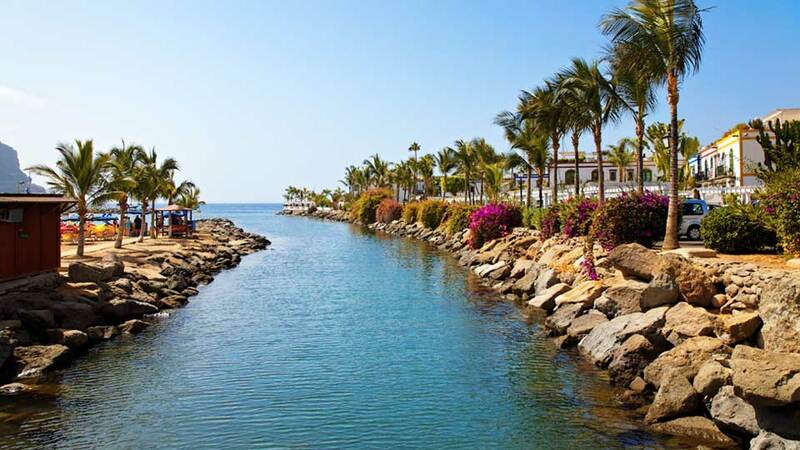 Puerto de Mogan, known as the “Little Venice” of Gran Canaria, is a picturesque town in the southwest. The houses, waterways and small bridges are all reminiscent of old Italian and Spanish architecture. Those seeking a taste of Canarian style living by the beach should visit Playa de Mogan. The sheltered water in Mogan makes it a perfect snorkeling spot. From the surface, snorkelers should delight in the thriving and colorful marine life. If that is not enough, then a claustrophobic adventure awaits those coming on board a yellow submarine. Sandwiched between Puerto Rico and Puerto de Mogan is the man-made beach of Playa de Amadores. Although the literal translation of the name is “Lover’s Beach”, this 800-meter expanse of Carribean sand is a favorite family destination. Shaped like the crescent moon, the beach features clear, calm waters and wide, sandy shores. Being sheltered from the North Atlantic currents and waves, the water is ideal for children. To make things more exciting, there are numerous water activities such as jet skiing and water biking to add to the thrill. Aside from family-friendly beaches, there are aquatic and theme parks on the island that is well worth a visit. Children and adults alike can experience top rated fun and excitement in these carefully designed family attractions. 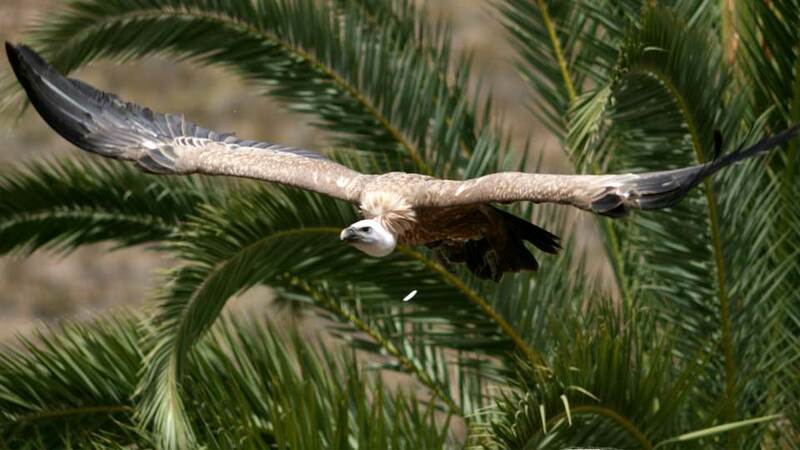 Located in the center of the island, Palmitos Park in Maspalomas is the top family attraction in Gran Canaria. Boasting of over 1,500 bird species and over a thousand palm trees, this enormous park is almost impossible to complete in one day. Visited by thousands of visitors daily, parrots perform amazing tricks that never fails to elicit laughs from the crowd. This man-made tropical oasis also features dolphins entertaining guests with their incredible feats. Thrill-seekers would have their fill for the day at the second largest water park in the Canaries. Aqualand Aquasur in Maspalomas features over 30 different slides and 15 other attractions. There’s no limit to how loud one could shout as they take on the group slides in the Mamut or twin slides in the Tornado. For more adrenaline-pumping thrills, there’s the option to go solo in any of the three Aquamania slides or in the Anaconda. For a completely different experience, the Sioux City Park in San Bartolome de Tirajana is a stark contrast to the sea surrounding the island. Relive the era of the wild west and watch actors lasso and ride horses like real cowboys do. It is entertainment taken to the next level with duels, bank robberies, knives, ax-throwing and even cowboy dancing. Here, visitors could say hello to the most poisonous snakes, spiders, and reptiles in an exhibition. Tourists also feel young at heart as they dress up as cowboys and take part in one of the shows featuring horses. The rare mix of culture in Gran Canaria is a testament to the various influences the island has accumulated over the years. Even during the pre-Hispanic times, its harbors have stood as witnesses to the fascinating evolution of its heritage. These days, it proudly showcases a well-preserved culture and legacy with the many museums, historical, and archaeological sites that mark the island all around. A trip to Gran Canaria is like a journey back in time. This crossroad of an island has merged multiple cultures from a thousand different places. At present, a glimpse into its pre-colonial and colonial past still cling tightly around its most valued architectures and villages. 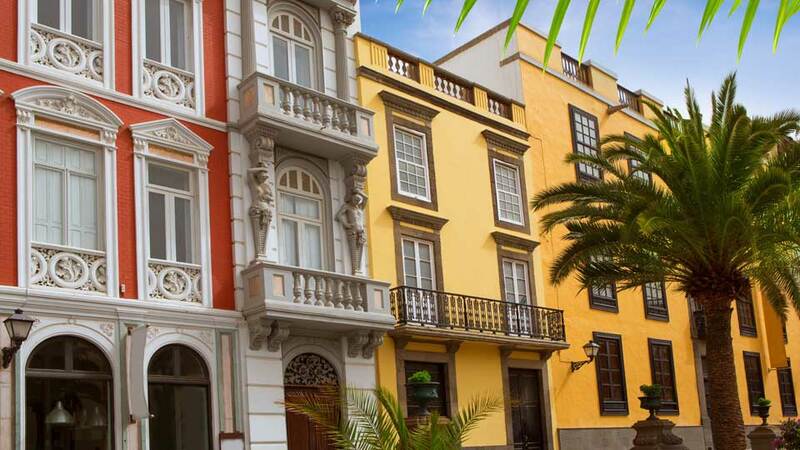 We start off in the streets of Vegueta, a captivating old town south of Las Palmas. Go back in time to the 15th and 16th century while taking a lazy afternoon stroll on its cobbled streets under a warm friendly sun surrounded by the alluring Spanish architectures. Gothic and Neoclassical architecture collide at the Las Palmas Cathedral, one of the most important landmarks of Vegueta. The town’s marketplace is a mixture of the past and the present with many products found on the island, as well as modern bars and restaurants. A prominent architectural and historical building at the heart of Vegueta is the Santa Ana Cathedral, which had taken 4 centuries to complete. 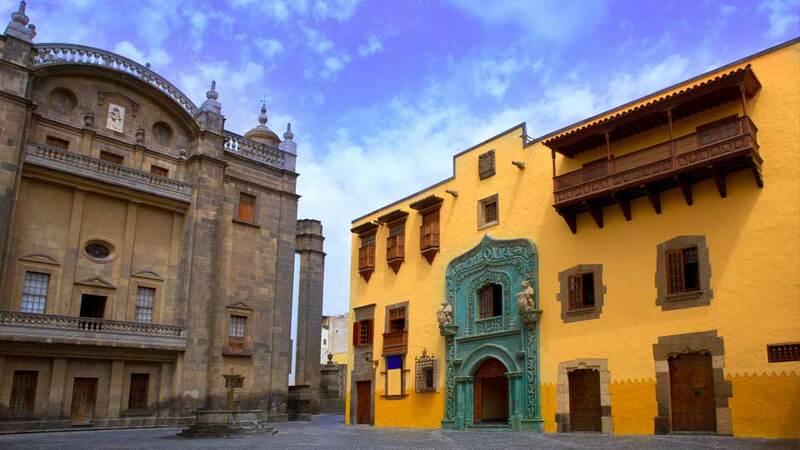 Typical of most Canarian architecture, it features a beautiful blending of Gothic, Renaissance, and Neoclassical style. Outside, the twin towers rise above neighboring buildings, as if to pronounce its importance. Even more impressive is the interior that is adorned by sacred artifacts, historical paintings, and noteworthy sculptures. Lastly, a drive south to the picturesque Mogan reveals a small fishing village known as the “Little Venice” of Gran Canaria. The rich waters attracted fishermen long ago and led the way to the building of a historical port. This small rural village is framed by trees and buildings that exhibit Spanish and Italian structural designs. 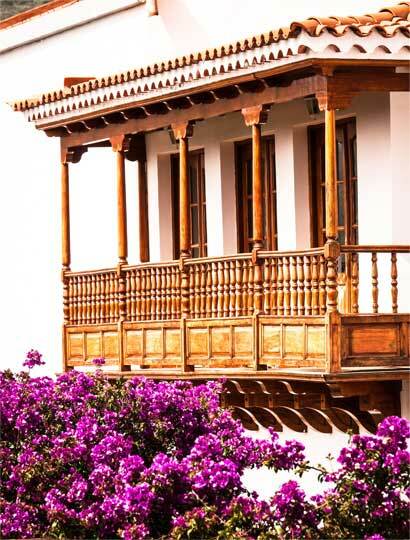 It is embellished with narrow waterways, lovely bridges and flowers hanging from colonial houses’ balconies. The pre-Hispanic past of Gran Canaria is hardly a mystery. The network of archaeological sites on the island is open for everyone to examine. Each little nook and cranny give visitors a front seat to the unfolding of its rich cultural ancestry. Following a spiral path to the east of the island, travelers will find Barranco de Guayadeque. The ravines are a mere 30-minute drive from Maspalomas and situated between Aguimes and Ingenio. The trip takes us to one of the most stunning natural landscapes sheltering the most number of archaeological sites on the island. While exploring the valley from the visitor’s center, guests will find traces of typical Canarian living all around. The small village decorated with palm groves is a culture magnet with its cave homes, cave church, and even a cave restaurant. To spot the most important archeological site in the Canaries, tourists could stopover at Cueva de Pintada in Galdar, north of the island. Discovered in 1873, one would feel like hopping on a time machine upon seeing its 60 buildings and museum. The cave walls are painted with black, red, and white geometric figures, all believed to be symbolic and functional to aboriginals. It also houses typical ancient artwork and household items, giving us a peek at the simple lifestyle of the island’s original inhabitants. 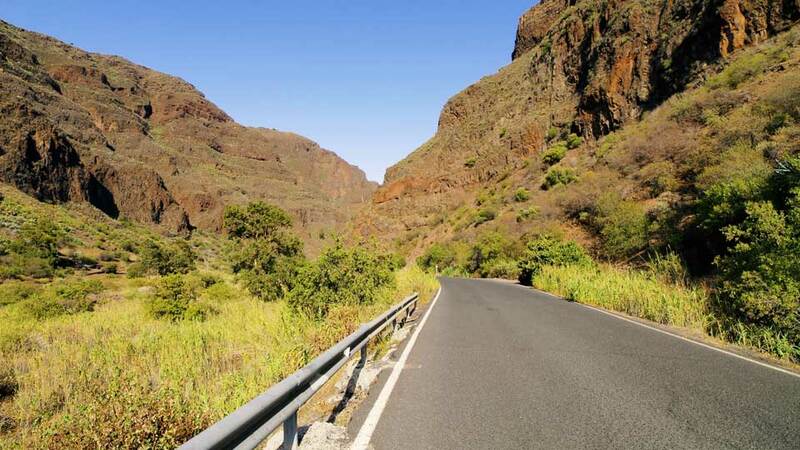 To see actual locals still living in the most beautiful cave dwellings, one must drive up a winding road to Artenara, the most elevated village in Gran Canaria. 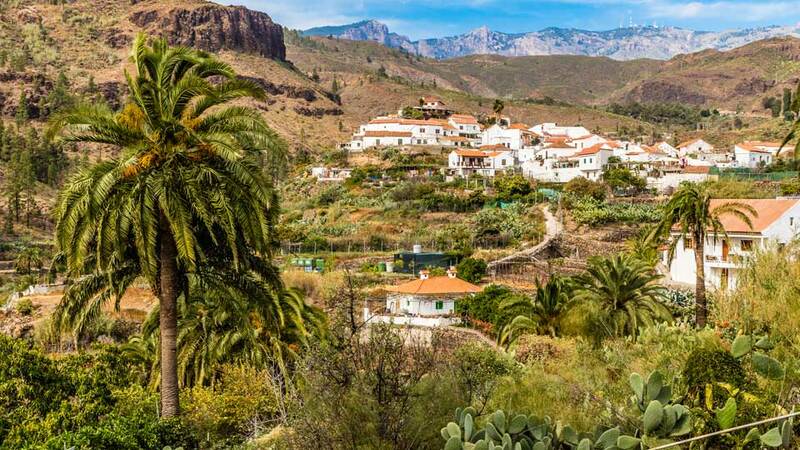 The village sitting on the hillside offers fabulous views of the Tamadaba Natural Park, Roque Bentayga and Roque Nublo. Upon arrival, visitors are also welcomed by a Christ statue with widespread arms. One of the oldest villages in the Canaries, Artenara still observes a yearly procession in honor of the Virgen de La Cuevita. Aside from ancient churches built with red stones from Tamadaba, this serene mountain village nestles Acusa, a site with immense archaeological importance. The best way to get lost and learn all about the profound history of Gran Canaria is by visiting the island’s famous museums. Each offers a lens that would take visitors back in time, from the ancient times to the colonial periods. Casa de Colon or Columbus’ House was allegedly a temporary dwelling of Christopher Columbus in 1492 while his ship was being repaired. Set in Las Palmas, it is reminiscent of old Canarian architecture with its huge courtyard, and wooden ceilings and balconies. Within its walls, 15th and 16th-century paintings tell a vivid story of how Gran Canaria became the gateway to America. Now, more than five centuries old, the house is partly a library, a museum, and a place of seminars. For a glimpse into its pre-Hispanic past, tourists could pay a visit to Museo Canario, also in Vegueta. 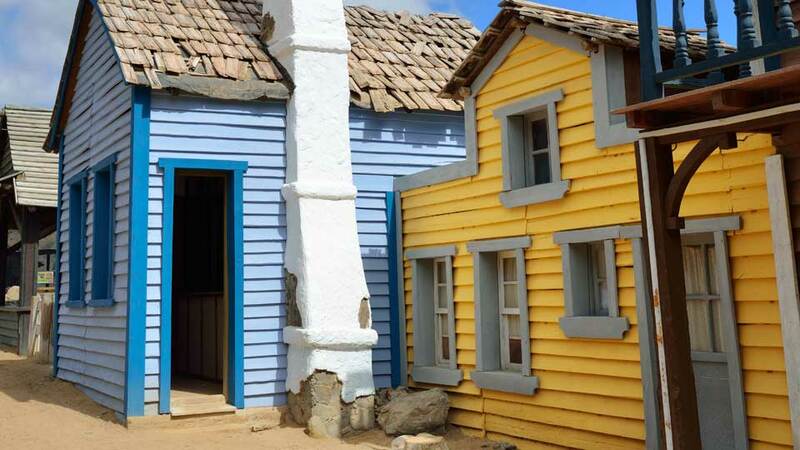 Built in 1879, it has been a major resource of valuable historical and ethnographical information about the Canaries. Once inside, visitors would learn the scientific phenomenon that made the Canary Islands the paradise that it is today. It even takes visitors as far as closely examining the skulls of the island’s ancient inhabitants. Getting immersed in real Canarian rural living is possible if you pay a visit to any of its 21 municipalities. For instance, Tejeda is known for marvelous landscapes and delectable almond-infused desserts. But to learn all about the village, Tejeda History and Traditions Museum is a must visit. Here, visitors get a closer and more interactive experience on rural Canarian living in the audiovisual room. Centuries of Spanish, African, and Latin American influences baked Gran Canaria’s diverse gastronomy. Its bountiful lands make way for plenty of tropical fruits and vegetation. Meanwhile, the surrounding sea serves as an unlimited resource of fresh fishes and other seafood. No matter where you dine on the island, you’ll always be in for palate-pleasing surprises. 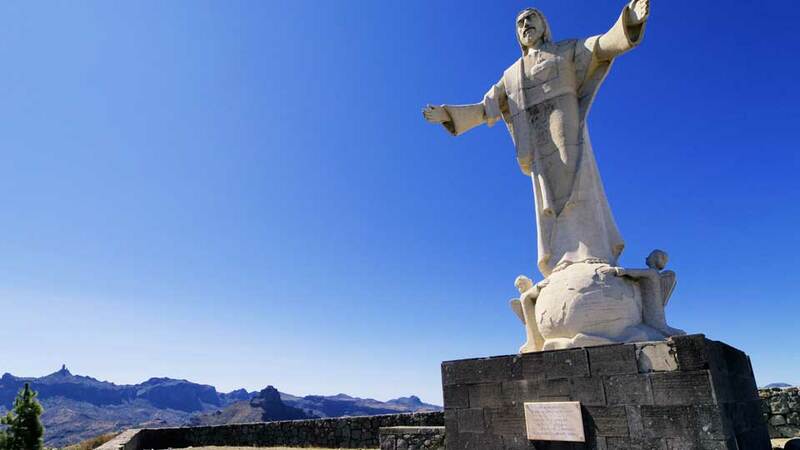 Visitors who took a trip to the mountainous village of Tejeda have raved about Let Me Take U or Dejate Llevar. 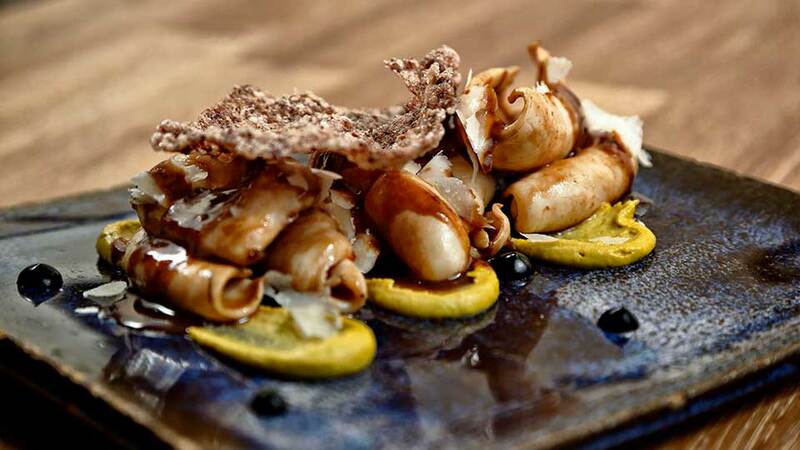 This top-rated restaurant is a little out of the way, but definitely well worth the trip. The narrow and winding drive or walk is rewarded by a superb homey ambiance and excellent food. Try their house special, the Peruvian ceviche. It’s a salad made only with the freshest ingredients, same with all the dishes in their menu. Delight in the company of warm and welcoming owners, while enjoying a meat croquette or the best mussels and mojos in town. Like finding an oasis in the middle of the desert, LoLa quenches every diner’s thirst for skillfully cooked food. This hidden gem in Playa del Ingles is a favorite dine and wine spot for many tourists. The friendly staff, lovely atmosphere and exquisite menu leave everyone hungry for more. LoLa offers International, Mediterranean, and Vegan-friendly food options. 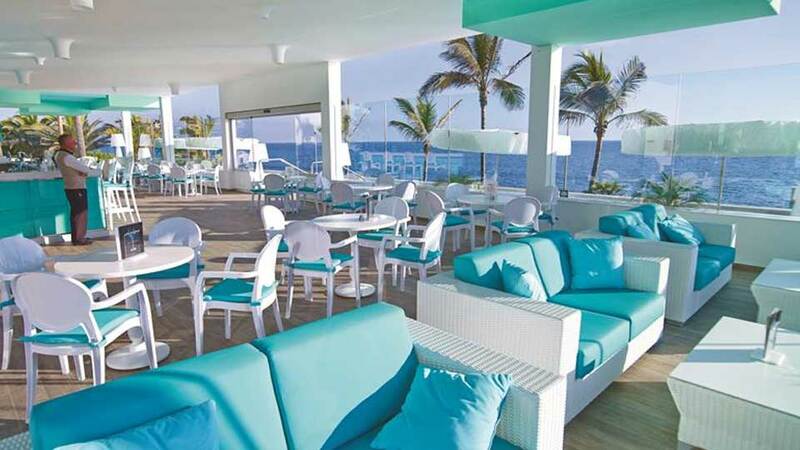 Indulge in their red mullet, octopus carpaccio or special meatballs. Better yet, end a perfect evening by taking a pick from their good selection of wine. 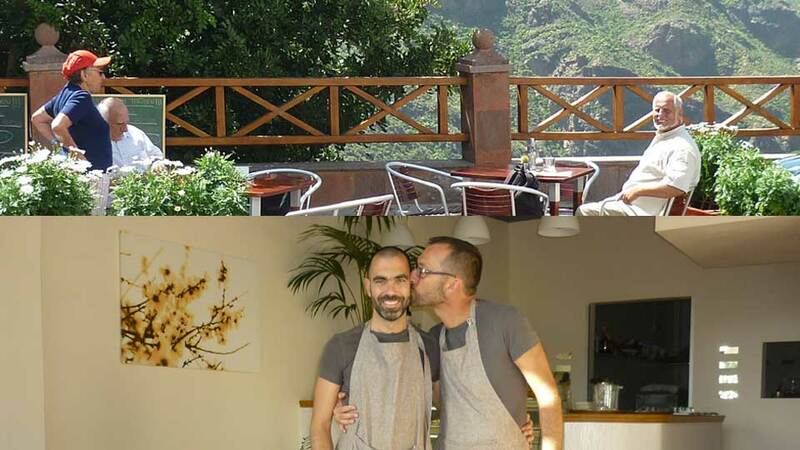 No foodie will ever get disappointed by heading up north and dining in Que Leche, a small unpretentious restaurant in the city of Las Palmas. This cozy diner serves mainly Spanish, European and Mediterranean cuisines. People make their way to Que Leche for their fill of tapas meal or their fish dish. Others will never leave without tasting one if its dessert offerings. Be warned though. The tables inside could easily get filled, but dining by a picturesque street isn’t exactly a bad idea. Gran Canaria has been a favorite tourist destination for individuals, couples, and families in and around Europe. Consequently, thousands of accommodations have also sprung up over the years. People who choose to stay have a myriad of options ranging from the cheapest apartment to the most luxurious hotels. 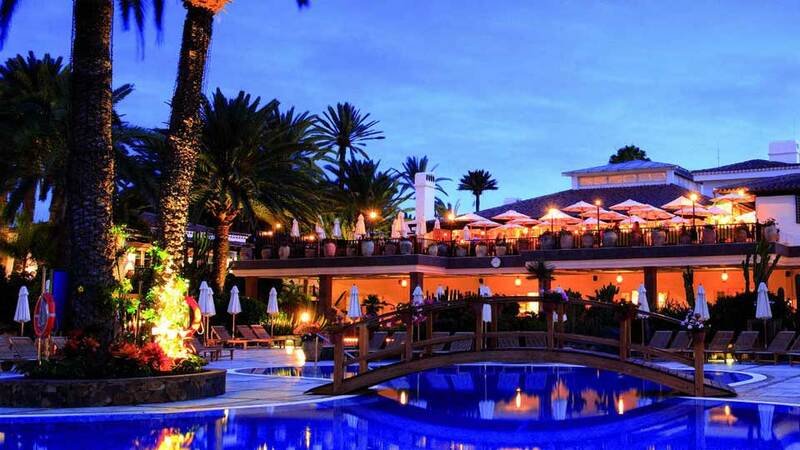 For 5 star hotels, Seaside Grand Hotel in Maspalomas has made a name for itself. The impeccable service, complete amenities, and delectable food makes it a true home away from home. As guests settle in their well-maintained rooms, they are treated to world class service by their attentive, but never intrusive staff. There’s plenty of activities for children apart from its good-sized pool. For those who wish to explore, trips around the island could be arranged by the hotel. The delicious breakfast and dinner buffet, as well as the weekly barbecue by the pool bar, are some of the highlights of most tourists’ stay. 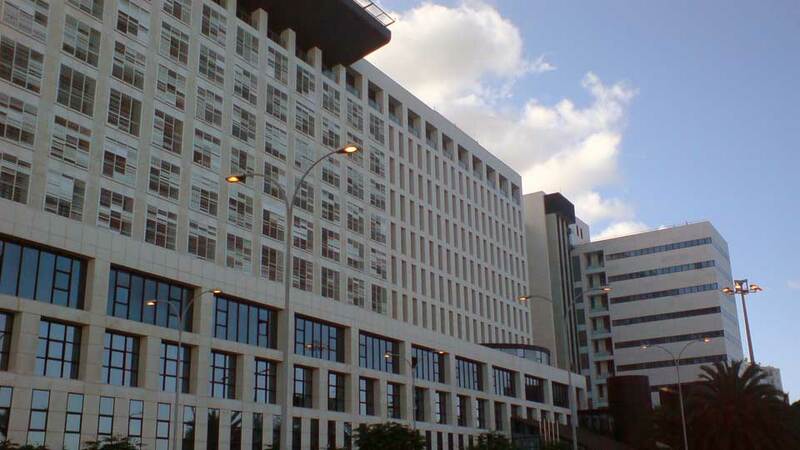 In Las Palmas, one of the best value options is Santa Catalina Hotel. Situated in front of a lovely park and off the main street, it is accessible as it is secluded. Beyond the crisp and clean sheets, the old-style architecture adds to its charm. A mere 5-minute walk from the marina, there are plenty of dining choices around the tree-lined space. Their polite and knowledgeable staff are always ready to lend a hand, making guests’ stay truly pleasant. Another highly recommended hotel in Maspalomas is Hotel Riu Palace Meloneras Resort. Offering a superb view of the sea, its rooms are elegant and spotless. Just minutes away from the Meloneras beach, it’s a great place to stay after a full day of outdoor adventures. The hotel’s complete amenities include outdoor pools, gardens, and a fitness center. Guests could enjoy a sumptuous meal in the hotel’s restaurant. The excellent staff will make guests feel welcome from the time they arrive and to the time they pack their luggage and leave. A myriad of other options abounds on the island. These include apartment rentals and smaller tourist dwelling. Whether the choice is to wake up to the sound of waves, or to the grandest views of hills, there’s a place for every traveler in Grand Canaria. 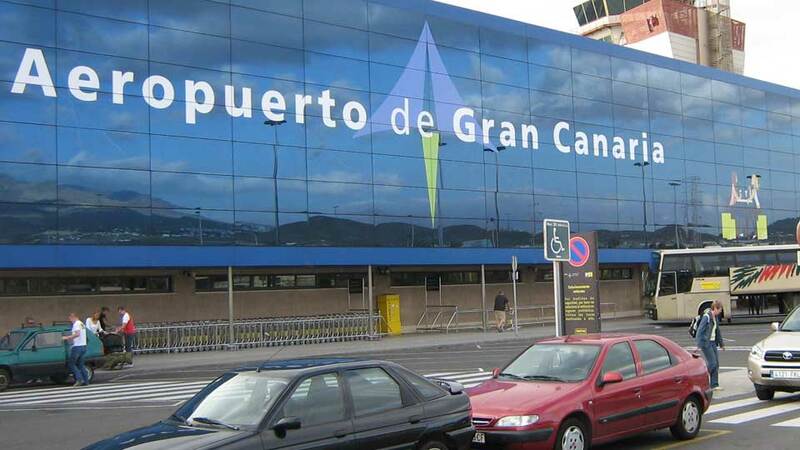 To start a perfect travel plan to Gran Canaria, flights may be booked from any of the airlines that operate across the UK. There are Ryanair, Monarch, EasyJet and British Airways to name a few. Getting to the island via boat is also pretty popular. Contact any of the maritime companies to secure a ferry ride. This is also a good option to transfer from one Canary island to another. Once on Gran Canaria, there are multiple means tourists could travel across destinations. Those who wish to follow their own pace and path may opt to rent a car from the various car hire companies. All one needs to do is book ahead online, or contact them once at the airport or at the hotel. For short distance travels, another convenient option is to grab a cab. Taxi fares are regulated and are considerably cheap depending on how far the destination is. The fare from the airport costs around €30 to Las Palmas and about €50 to Maspalomas. Meanwhile, the fare from the airport to Mogan is about €70. Perhaps the most popular option for many tourists who wish to experience the true Canarian culture is to take the bus. Las Palmas has one of the most advanced bus systems on the island. There are also interurban buses with regular schedules that could take anyone to any of the main terminals in the island. Look up Global buses (intercity buses) and Guaguas (urban buses) online. Remember to always have some change handy. For those carrying an Android smartphone or an iPhone, a free app with timetables of bus schedules is downloadable. When on a holiday trip, the last thing anyone wants to happen is to spoil the fun due to health and safety reasons. So just like any tourist destination, it is a good idea learn the health and safety hazards one might expect. Gran Canaria, however, is as safe as any island in the middle of the Atlantic Ocean can get. There have been no incidents of shark attacks, poisonous snake bites, earthquakes or hurricanes here. There are also no civic threats and the locals are pretty warm and welcoming. The crime rates are low, but it’s good to take precautionary measures when alone at night. It’s predominantly a gun-free island, same as the rest of the Canaries. When driving a rented car, remember to drive on the right and choose to occupy the outer lanes on roundabouts. When swimming or surfing, always heed the flag warnings on the shore. There are rare times when jellyfishes abound in the sea. Although lifeguards are on duty on most beaches, it is best to be careful. In case medical attention is indeed necessary, dial 112 to call an ambulance or drive straight to the emergency departments of hospitals. Europeans may utilize their European Health Insurance Card. Meanwhile, citizens from other countries may need to do advance research to find out if their health cards would be useful. General travel related health precautions are always handy. For instance, hiking means one would need to bring ample water to avoid dehydration. There are no required vaccinations before entering Spain. But the World Health Organization’s advice is to get standard shots for certain diseases such as measles and polio. Traversing even half of the natural wonders of the world is a dream most of us will never experience. Bouncing from one continent to another can be taxing, not to mention costly. And really, who has enough time for that? So, most people settle for a single destination at least once in their lifetime. But why compromise when there’s a mini-continent that has it all? In Gran Canaria, we get some of the world’s best natural, geological, and cultural scenes. It’s the perfect blend of dry Southern terrains and Northern natural reserves. This island offers surprises with its nerve-wracking waves one moment and tranquil beaches the next. It offers a feast of emerald pine-scented forests on one side and golden sand dunes on the other. It’s a beautiful mix made even more special by a bright weather all year round. Amidst the immaculate beaches and a bustling city, we find a heritage of affluent cultures. The landscapes may vary, but in its heart, warm friendly smiles and an incredible history are engraved. The thrill, grandeur, serenity, and enjoyment travelers collect in Gran Canaria can rival that of any explorations elsewhere.